Manchester United boss Jose Mourinho has told Arsene Wenger not to retire from management after the Frenchman announced his decision to step down from Arsenal. Arsenal sent shockwaves through English football this morning when the Gunners released a brief statement announcing that Wenger was to leave the club after 22 years at the end of the season. 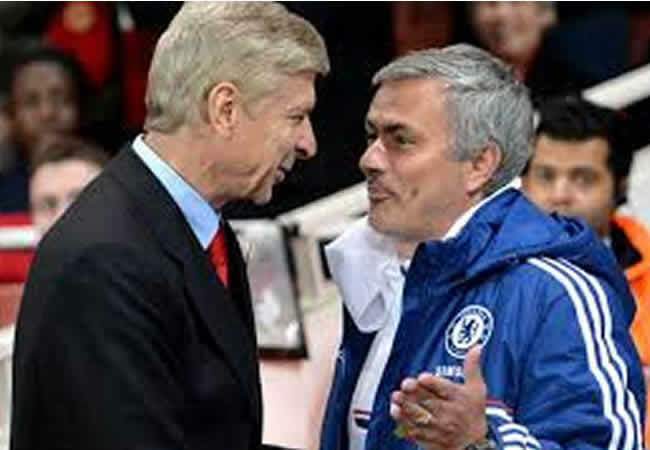 Mourinho and Wenger have clashed on a number of occasions since the Portuguese moved to England in 2004 and the Frenchman’s beaten the self-proclaimed Special One just once in competitive matches in the last 14 years. However, Mourinho praised Wenger for his work at Arsenal and said he hopes the Frenchman continues management elsewhere. “If he’s happy i’m happy. If he’s sad, I’m sad,” said Mourinho. “I always wish the best for my opponents. I always wish the best so that’s the point – if he’s happy with the decision he made, if he looks forward to the next chapter of his career then i’m happy for him. Wenger steps down from Arsenal having won 10 trophies in 21 seasons at the club, including three Premier League titles and seven FA Cups. The Gunners take on Manchester United at Old Trafford on the 29th April but their focus will be on the semi-finals of the Europa League with both legs sandwiched between their trip to Old Trafford. The Red Devils take on Tottenham in the semi-finals of the FA Cup at Wembley on Saturday and Mourinho’s believes Spurs do not have an advantage in that the game will be played in north-west London.